We’ve all been there before: we move forward with something, thinking it’s the best way to get from point A to point B, only to realize we are so wrong. It’s little surprise some of those mistakes are made with our credit and finances; after all, there are always many options. Any of them look familiar to you? Did you know there are more than 1.5 billion credit cards being used right here, right now in the U.S? It’s a massive engine that drives the American economy and the decisions we make can affect things on a much larger scale. Some say they’re a necessary evil, others say they’re a powerful financial tool that can put into place a foundation for always having options. Either way, there are always those areas where we can trip ourselves up. It’s true – the fine print is where the relevant information is always found. Keep in mind, though, courtesy of new laws, the fine print has become a bit easier to understand. In fact, the Federal Credit CARD Act of 2009 offers significant new consumer protections. One of those rules is that credit card companies must provide certain (and vitally important) information both before and after you open a new credit card account. Not only that, but the any fees can’t be hidden and they can’t be tacked onto your account without clear language. Those great 0 percent APR offers must be applicable for at least 6 months and your interest rate cannot be raised, for any reason, without a 45 day advance notice. Keep in mind, it’s not that any of the traditional rules have been changed, only the way the credit card companies and banks are able to use them. You can still be hit with that high default rate if you miss a payment during a promotional period, but you are allowed a 45 day window before that higher rate kicks in. You can find all of these rules in the new laws. Have a kid that graduates high school in a few years? Planning on taking out a loan for his college tuition? Prepare to pay more in interest. Is your wife hoping for a new car in a year? If so, prepare to pay more interest. Taking vacation this summer? Even if you’re saving and planning on using cash, any credit card you use for the rewards points means more interest you’ll pay. The new Discover IT card allows one free pass for a late payment (which is just one of the many reasons this is a great choice for many consumers). You’re not forced to pay a late payment and you don’t have to worry about a rate increase. However – and this is important – if you’re a serial “last minute” kind of person, this isn’t going to serve your purpose if you tend to pay late on occasion. 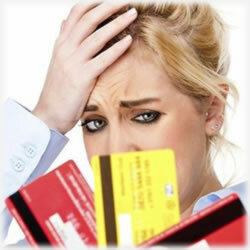 Each month, you should be attempting to pay your credit card balance its entirety. Even if it’s not reasonable right now, and you fall short, your goal should then be to always pay more than the minimum due. It’s just a good personal finance habit. Ultimately, even just $10 extra you pay comes back to you whereas if you pay just the minimum due, you’ve not only lost that extra $10, but you’re paying on it again and again. It’s also that much longer you’re paying on that credit card. Fortunately, every credit card statement these days must have a block of information that includes what making the minimum payment means. This is courtesy of those new financial laws – and it’s a good one. Many – too many – consumers are dancing with the edge of a cliff known as the credit limit. The odds of you falling off that ledge are great. Miscalculate the interest, an unexpected expense during the month, shipping fees you hadn’t counted on – any of this can send you over and when that happens, you not only hurt your credit scores, but you also will pay dearly in over the limit fees. You also jeopardize your intro rates if you’re still enjoying them. In fact, most credit counselors encourage us to never use more than 10% of our available credit. That’s one of the biggest and most dangerous habits we can get into. By not checking our monthly statements, we run the risk of missing telltale signs that our accounts have been hacked and our identity compromised. There are many consumers who have similar tales of being only focused on the due date and the balance, only to realize later that their cards were stolen and thieves had been wreaking havoc for months. And if you don’t think it can happen to you, think again. Credit card theft and identity theft are on the rise. For those reasons, many are pushing for the new credit card safety features already in use in other countries. Before you think this is a harmless action, you should know your credit card company is going to hit you with a much higher APR for cash advances. This is another reason why reading the small print is so important. Cash advances have their uses, but really, they should be a last option when the other ones are too expensive. This one always amazes us: American consumers avoid speaking to their credit card companies as much as they avoid a sales call during dinner. Your bank or credit card company holds the golden chains and can play a significant role in how your finances play out. If you’re late with a payment, calling the card company can actually result in learning you can change your due date. In rare instances, you might can even get the late payment removed (though that’s just as unlikely as it is likely). But that’s not all – you can negotiate with your card company – especially if you have an excellent history with the company. Think you deserve a lower APR? There’s a good chance your bank or network agrees – especially if they’re concerned you’ll abandon them in lieu of a better offer from its competition. And yes, their goal is to remain profitable, but sometimes, the profits are found in the satisfaction of its customers. Don’t underestimate the value of your financial discipline. It can benefit you for many years and in ways you have yet to discover.